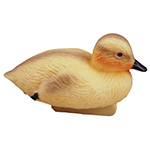 Add a touch of life, color and whimsy to any pond or water garden with this irresistible baby duckling. Made of durable blow-molded hard plastic. Each bird is intricately painted with a unique color finish that is lifelike and blends in naturally to any water garden. The cute baby duck can be anchored in place by simply tying a string to the underbelly. Can be anchored in place.